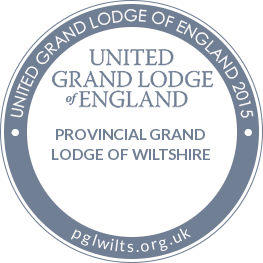 The Lodge meets at 6.30pm on the Monday following the second Friday in October, November, December, January, February, March and May. - We had 50 in attendance. - Maurice Leighfield is the only surviving Founder and still a valued member of the Lodge. - Peter Hanfrey presented a brief history of the Lodge. - Bro David Haydon of Gooch Lodge No 1295 presented to the Lodge the Founders Jewel and Past Masters Jewel of his late father W Bro Tony Haydon. - Honoured to have the Dep/Asst/PAsst PrGM’s present. - We also squeezed in a Passing ceremony that saw one of our 5 new Initiates take his next step - Bro Chris. - This was followed by a truly Festive board - Santa hats, carols and a festive menu. 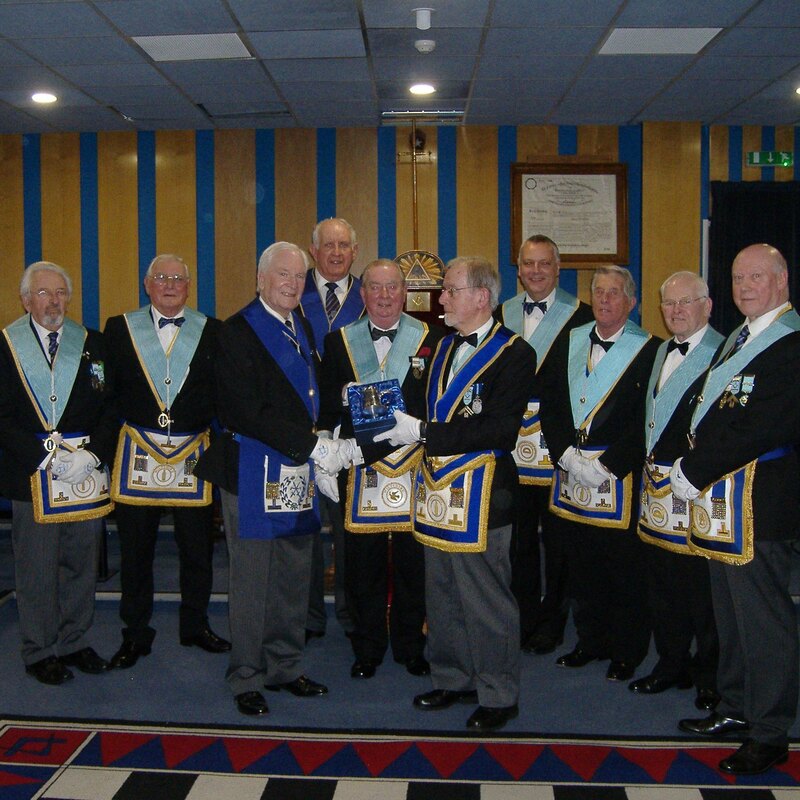 Each guest was presented with a booklet outlining the first 50 years of the Lodge. 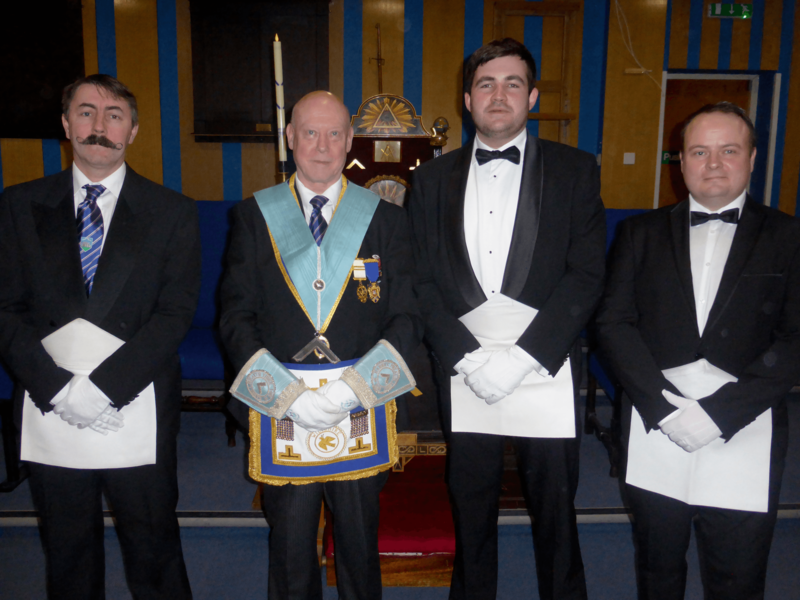 Photo Lto R - Glen who joined last Monday, The Master - Roger Prince, the two newest members Jason and Martin. In the 50th year since the founding of the Lodge we are moving with the times and changing our practices to the benefit of new Masons. With increased interest from good men wishing to know more about Freemasonry and ultimately applying to join the fraternity, the Lodge has recognised the need to adapt its procedures in order to meet the aspirations of new entrants. The Lodge recently applied for and was granted a Dispensation to hold an Emergency Meeting on Saturday 17th November in order to conduct a Double Initiation for Brother Martin and Brother Jason. 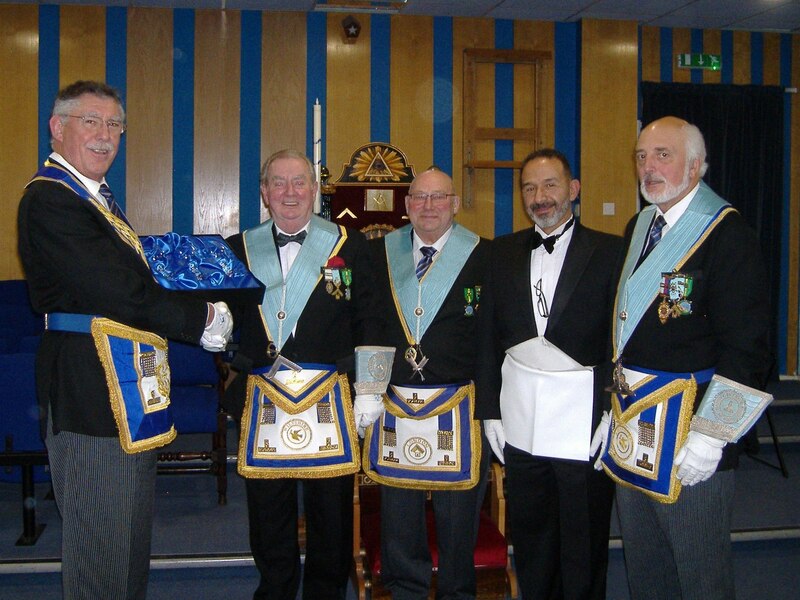 This was hot on the heels of the regular meeting held on Monday 12th November where we Initiated Brother Glen. Brother Glen had all of five days to enjoy being the most junior member of the Lodge. This was the first Double ceremony in well over twenty years, maybe even a first for the Lodge (the secretary has not reviewed all the minutes). We were really keen to do this to ensure the waiting list for new members is processed as quickly as possible - we do not want to leave anyone waiting too long to join us and enjoy the pleasure and privilege of being a Freemason. The ceremony was well attended and we were delighted to welcome fourteen visitors. In another break with tradition the Brethren enjoyed a light buffet after the meeting. Harry C Preater Lodge currently has five new Masons, with two more expected to join in early 2019, with more Double ceremonies planned. The Assistant Provincial Grand Master made a special visit to Harry C Preater Lodge to present a 50 year service certificate to Bro Peter Hanfrey. Peter was joined by Bros Terry McCann WM, Steve Lee Secretary, Terry Baker Chaplain, Peter Cowen IPM and David Packer ADC. 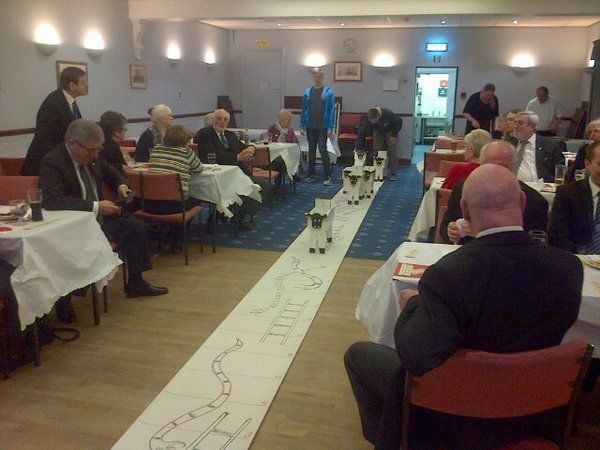 The Brethren of Harry C Preater Lodge No.8204 know just how to have a good time and they proved it once again after the recent meeting on Monday 15 February when they held their annual sheep race night. Fifty eight members and visitors including wives, partners and family members attended the Valentine’s Day Buffet and Sheep Race evening. The evening raised £350 of which 50% will be donated to Prospect Hospice and 50% to support the prostate cancer charity that Bro Kevin Logan is promoting. We had four sheep races - two featuring snakes and ladders, showing snakes and sheep can co-exist. We can also confirm that lamb did not feature on the buffet. Bro Eddy Hayward was head shepherd for the fourth annual running of this wonderful event. 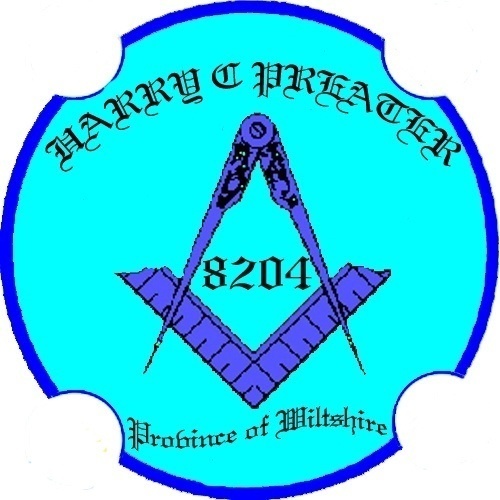 The Brethren of Harry C Preater Lodge No.8204 have paid tribute to VW Bro Maurice Leighfield, Past Deputy Provincial Grand Master of Wiltshire. Bro Maurice has recently completed 60 years service to Freemasonry – 48 years of which have been with Harry C Preater Lodge of which he is a Founder Member. The Brethren chose a unique and very personal way in which to express their congratulations and thanks to Maurice for his support and advice over the years when Bro Peter Hanfrey the next longest serving member of the Lodge presented him with a suitably engraved Handmade English Pewter “Masonic” Tankard. As befitting his modest manner the presentation took Maurice completely by surprise a point he acknowledged in replying to Bro Hanfrey's presentation. 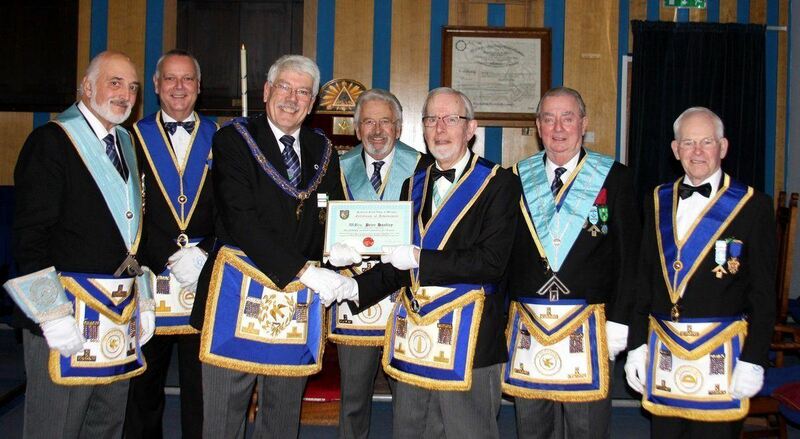 Maurice said "I will continue to support and advise the Lodge for hopefully many more years to come and that I will treasure the tankard for which I do thank the Brethren"
The photo shows the presentation to Maurice by Peter Hanfrey along with members of the Lodge. L to R: Terry Baker, John Bartlett, Maurice Leighfield, Roger Scratchley, Peter Cowen, Peter Hanfrey, Steve Lee, Edwin Hayward, David Packer & Roger Prince. going to use in the Winter edition of Across The Plain. 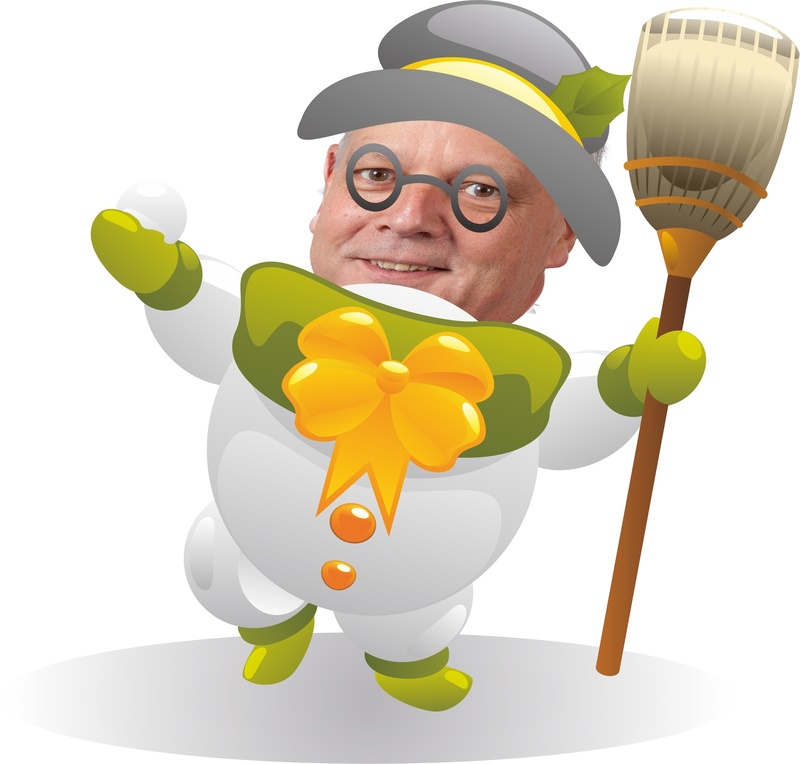 It seemed such a shame not to share the image with readers of the Provincial website, I wonder if you can identify the Brother hiding behind the disguise. If you recognise him don't tell us just let him know. 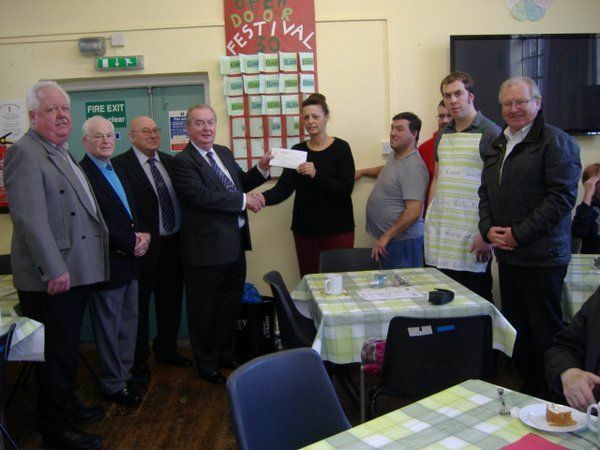 Swindon Freemasons from the Harry C Preater Lodge, meeting at the Masonic Centre in Old Town have presented a cheque for £1,000 to The Open Door Centre which is located at St. Barnabas Church Hall in Swindon's Gorse Hill. The Deputy Provincial Grand Master, Peter Winton, attended the November meeting of the Harry C. Preater Lodge No. 8204 to congratulate the Members on the early achievement of their Masonic Samaritan fund 2017 Festival Lodge Target. Also, to present the Lodge with 3 engraved wine glasses, an acknowledgement of this incredible achievement. The glasses were put to immediate use at the festive board by the Master and his two Wardens. The Master of the Lodge said the target had been achieved by the Members whilst still supporting local charities and the Lodge would continue contributing to the 2017 Festival as previously. The Lodge was named in honour of Brother Harry C Preater who was Provincial Secretary for a number of years (1942 to 1951) and Deputy Provincial Grand Master (1952 to 1966). The Consecration Ceremony was carried out by the Provincial Grand Master, - Lord Methuen, assisted by his Deputy, W Brother R A C Forrester and there were twenty Founders. The first Master being W Brother J A G Peare. Twenty Founders and 182 Brethren were present. The Ceremony being held in the Civil Defence Centre, Savernake Street, Swindon. W Bro George Hall was the founding secretary. The banquet was held in the Civil Defence garage, which had been suitably disguised.  The Lodge then held its meetings at the Masonic Hall, The Square, finally moving to the Planks when that building was completed. The first Initiate into the Lodge was a Mr J S P Britton, on 18th October 1968 but at the meeting on February 21st 1969, the Master announced that Brother Britton had lost his life as the result of a motoring accident. 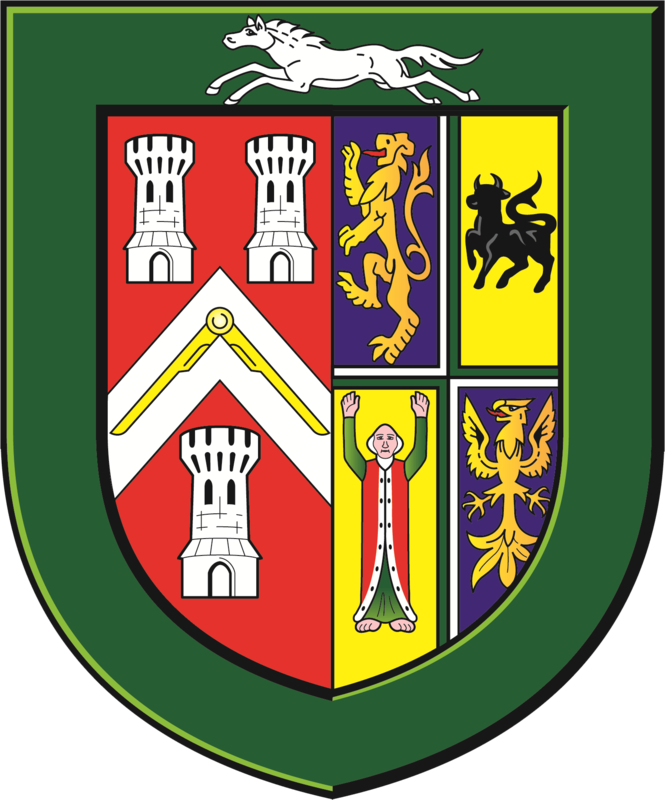 A Lodge Banner was Dedicated, on 16th October 1969. The Dedicating Chaplain being W Bro the Rev R S K Lance, Provincial Grand Chaplain.